As you may have figured from reading my posts, I am a shorewalker. I love the sound of the waves. (That’s why I named my Etsy shop WaveSong). 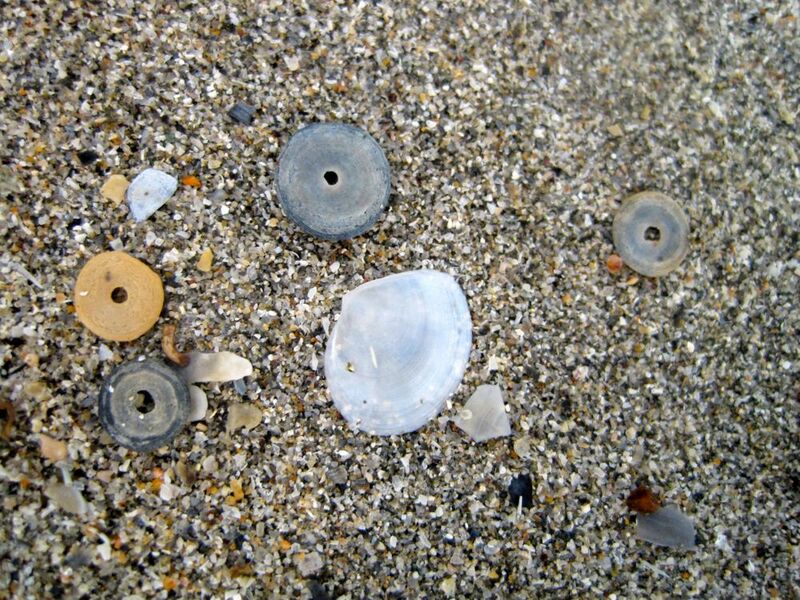 But most of all I love beachcombing. Most of the beaches I have been on while on my trip to Australia have been pure sand. And not much else. Not that pure sand isn’t lovely and all. But the treasure-hunter self in me is always more fulfilled by flotsam and jetsam. 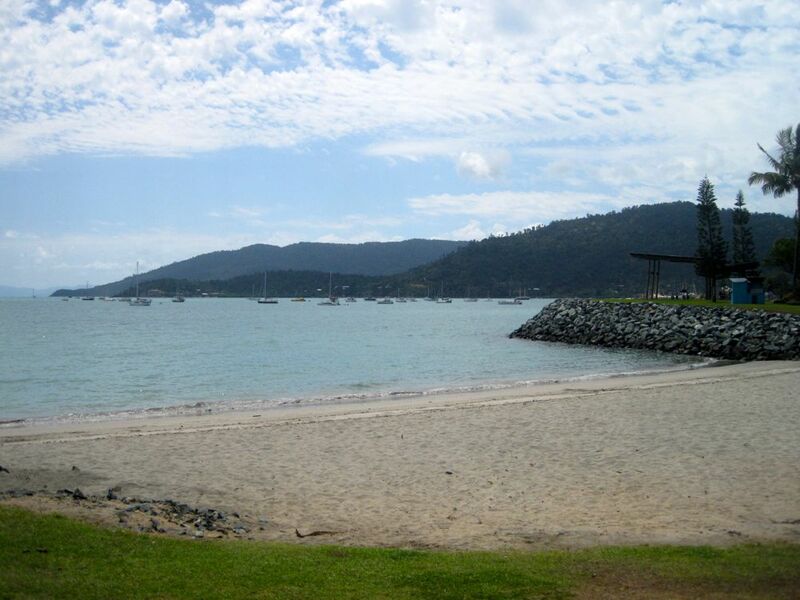 So I was tickled to find something more on the little tiny natural bit of sand at Airlie Beach, gateway to the Whitsunday Islands in Queensland. Low and behold I look down and find these. What I might call the Australian version of my beloved Lucky Stones. 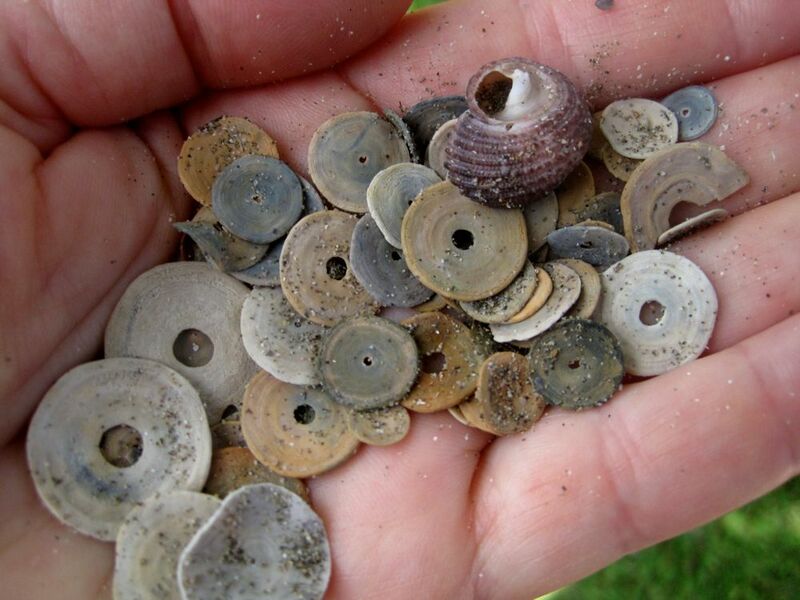 These are a shell-like disc with a natural hole. Perfect as supplies for the textile-artist in me. 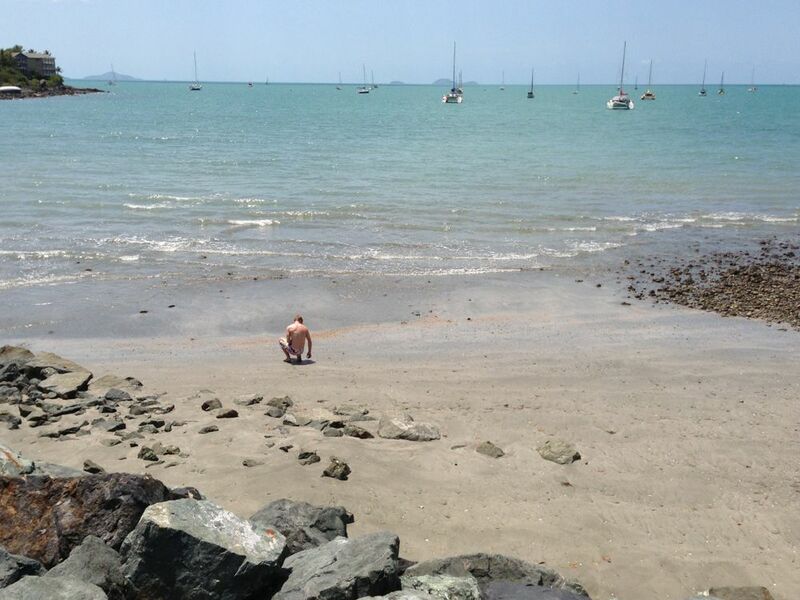 I was told that most Aussies don’t sit on the beach in Queensland. 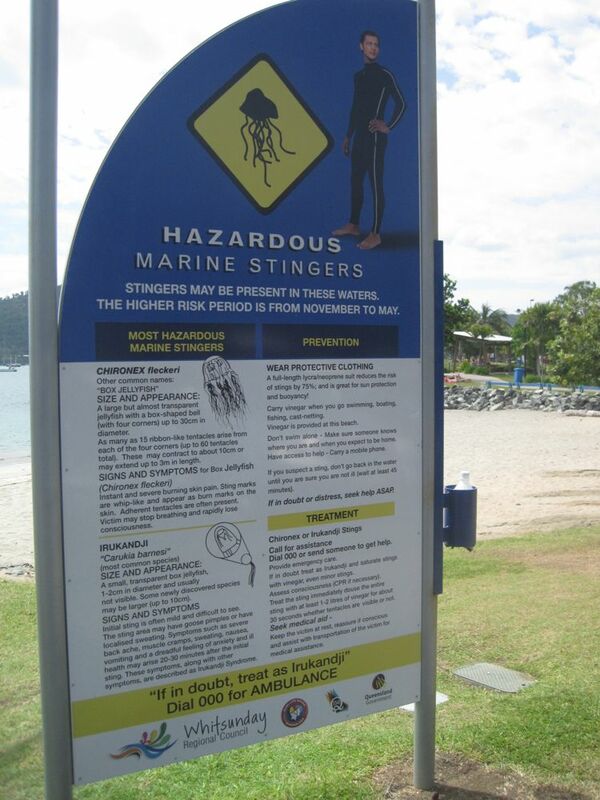 That might be because of the crocodiles and the hazardous marine stingers! Good call. Thus the bottle of vinegar supplied by the local authorities. 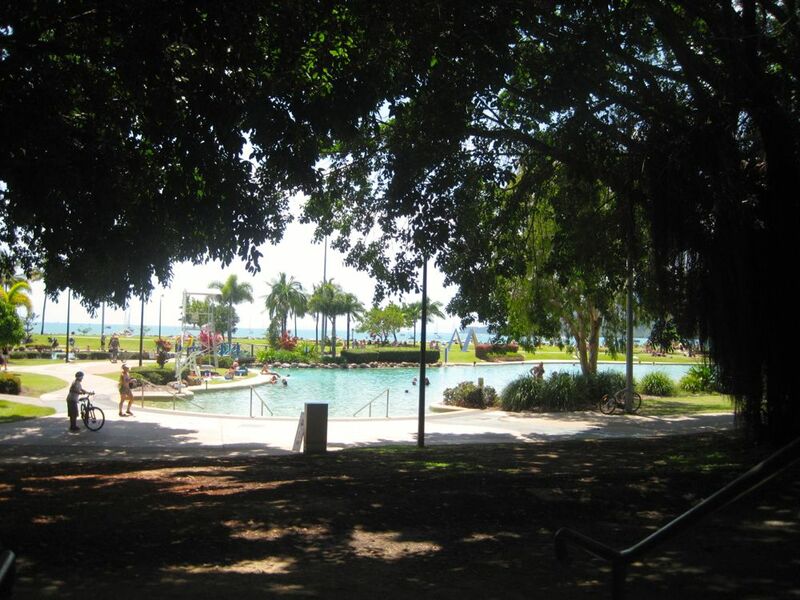 So they built a beautiful swimming lagoon right next to the beach instead! 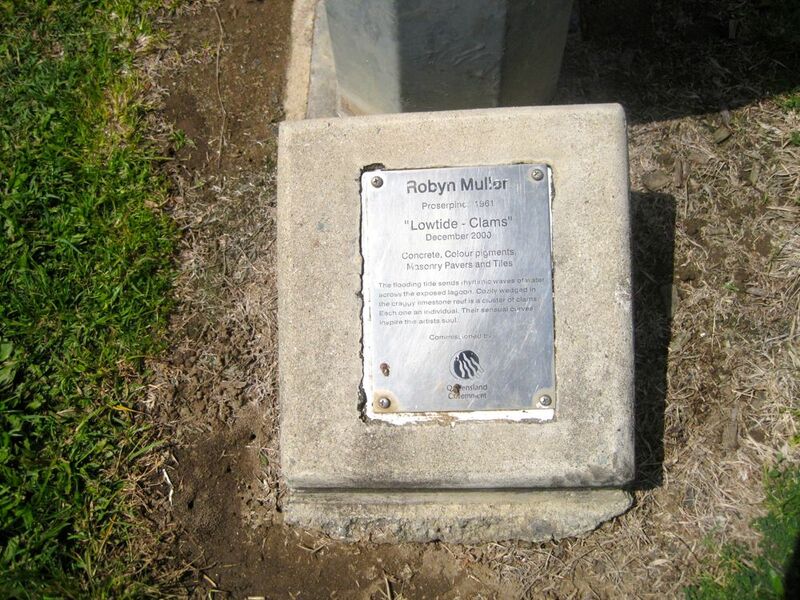 I have been so impressed with the beauty of the public spaces in Australia. Obviously it’s because they live outside all year, and don’t spend their public budgets on snow removal. 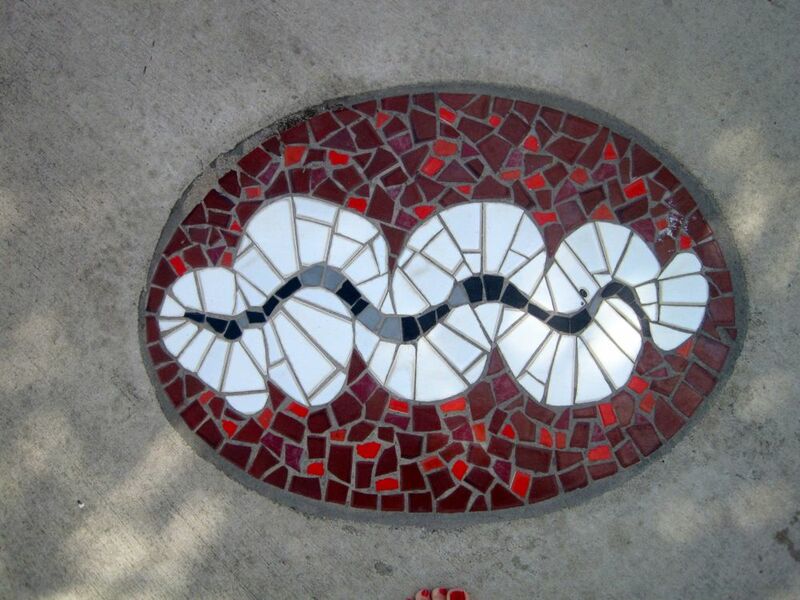 Public spaces are smartly designed and fitted out with lots of sculpture and art. 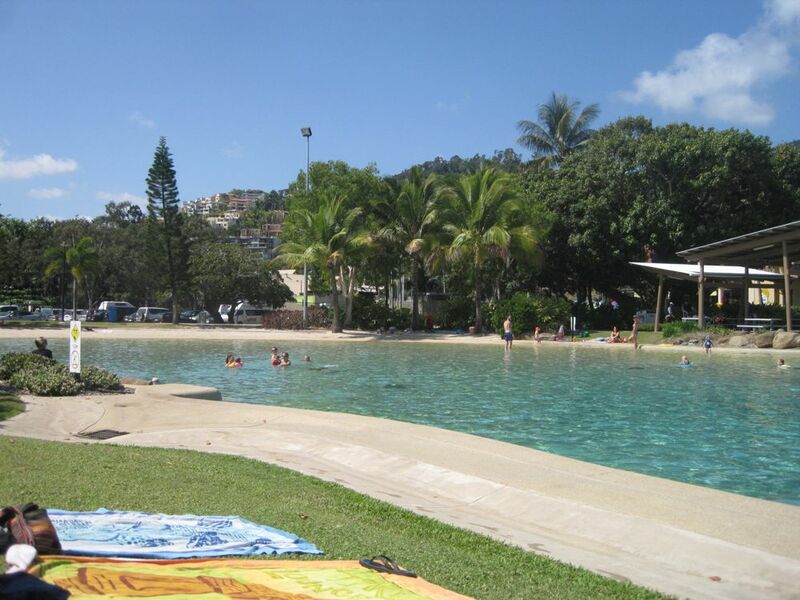 And Airlie Beach did not disappoint in this regard. 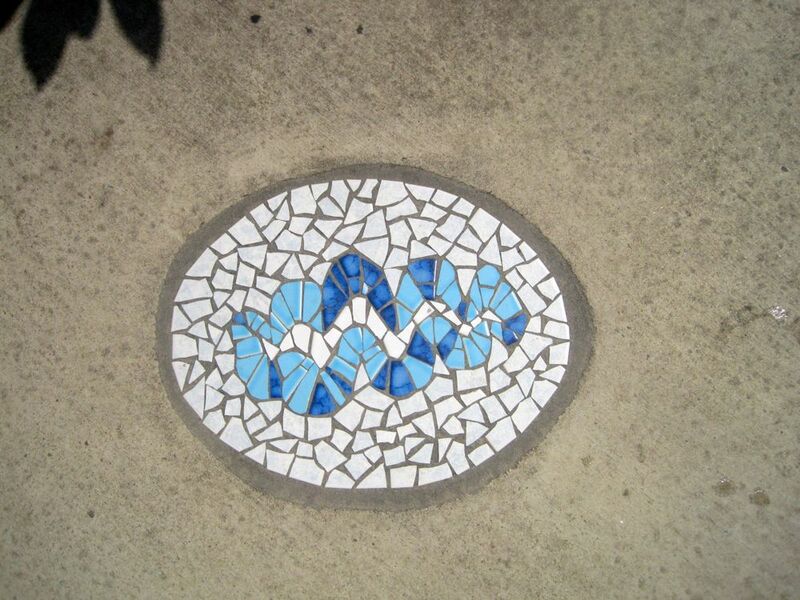 Like these sidewalk mosaics by Robyn Muller, called Lowtide Clams. 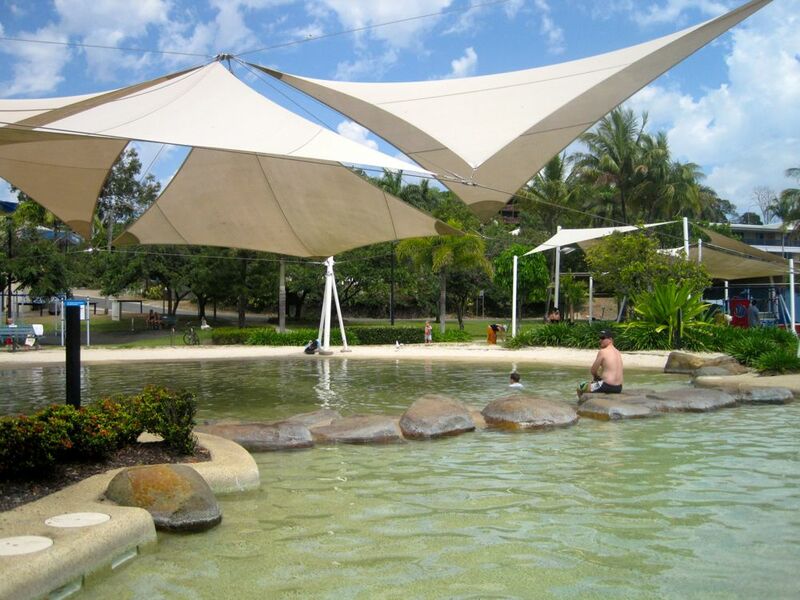 Children’s wading area nicely covered with shade. The whole area has a lovely boardwalk too. 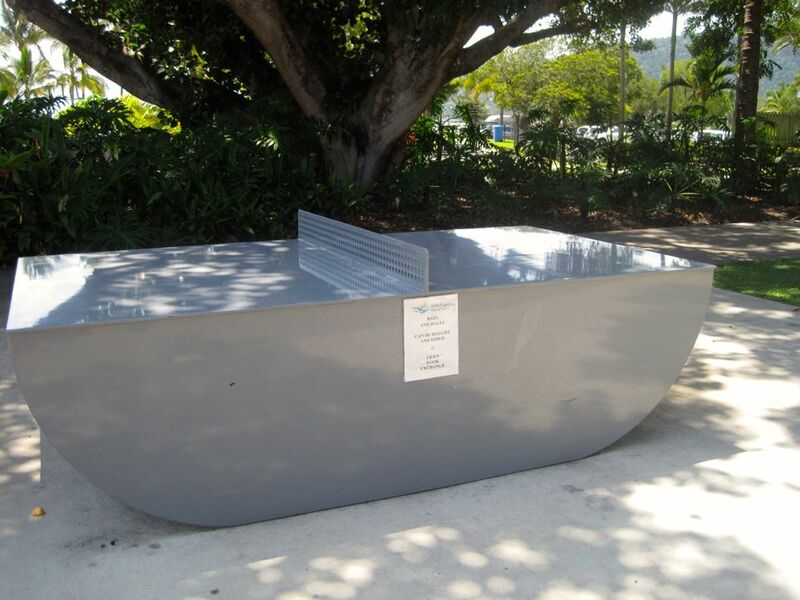 Including stovetops for “putting on the Barbie”, fresh water showers, toilets, change rooms, benches, picnic tables, alcohol free zones, playground equipment with a wheelchair-accessible swing and sand approaches to the swimming area. And lifeguards. Even a permanent ping pong table. 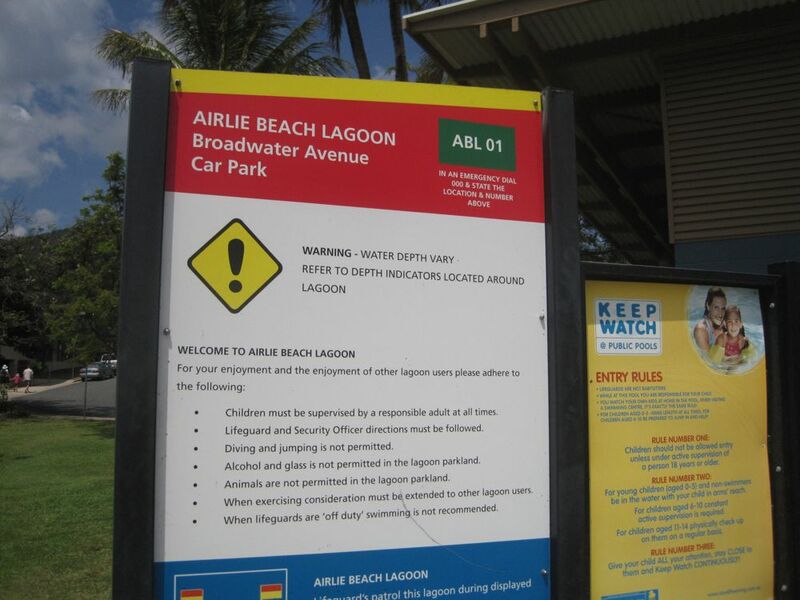 Airlie Beach really caters to guests and has some typical tourist trappings, but not kitschy. 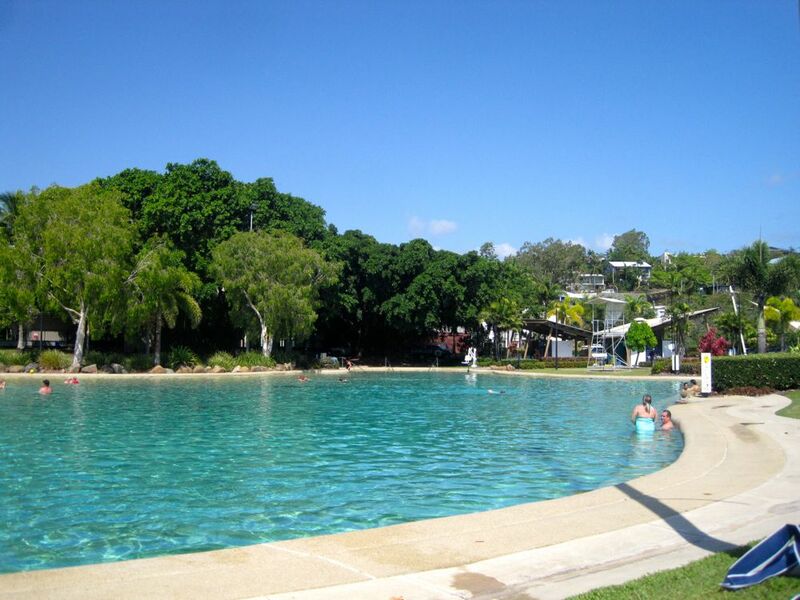 It is a haven for the wealthy and the poor backpacker alike. Have you ever been to a beach like this? 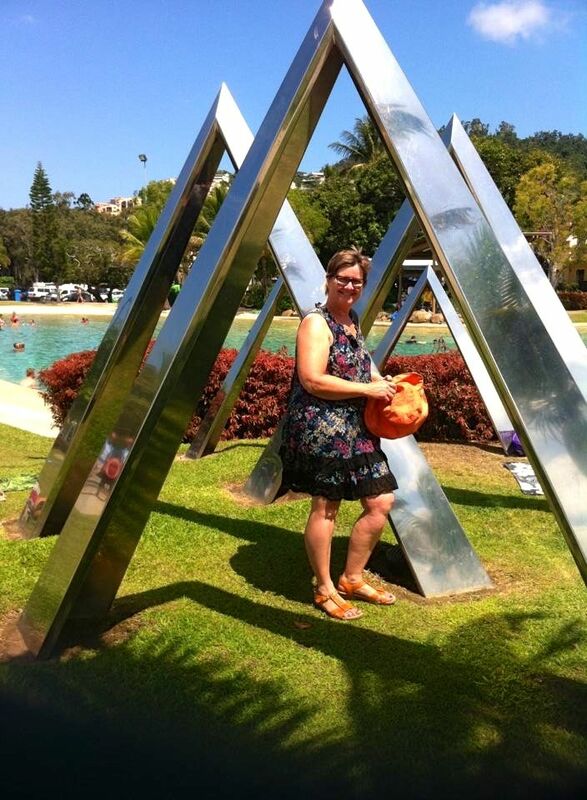 This entry was posted in Uncategorized and tagged Airlie Beach, Australia, beach, lucky stones, public art, Whitsunday Islands in Queensland on October 4, 2013 by nurturingspace.